In previous multi-day tours, we've had a single Tour Guide, but during this 3 day tour we had several different Tour Guides. While the process of moving from one group to another was fairly smooth, it was a little awkward to not be with the same group of people and guide every day. The Tour itself was great, we got to see so much. The lunch we had near Naples was great and the visit to Pompeii very informative. We had a large group in Pompeii, and it was pretty crowded there, but our guide Fabiano took us to the highlights. In Sorrento we had a nice hotel and enjoyed the breakfasts/dinners included. A highlight was our day trip to Capri. Our guide Sascha had some pre-arranging to ensure we got an immediate boat to the Blue Grotto even though there was a huge number of people all trying to do the same thing. We got into the Blue Grotto and shortly after we did it was closed due to waves. Cudo's to Sascha! The Amalfi coast is really beautiful and we spent the last free day of the tour visiting Positano. Transfers were not a problem and once back in Rome we were driven directly to our small apartment we had rented not a large hotel like most of the other guests. Our driver had a little trouble finding it but was very apologetic, and gave us information on key things we drove by so it was an enjoyable drive :. The first day the touring part in Pompei on the trip was fine. The lunch on the first day was not good. My husband ordered the beef and it was thin, cold and tasteless. Later that day we were transporting to our Sorrento hotel. At the hotel we were given printed instructions for the remaining two plus days. We were not told in advance that if we wanted to go to Capri that an additional 156.00 euros was needed per person. Communication were lacking for the entire trip. The hotel management did their best to help us with instructions to Capri. Our rooms at the hotel Michaelangelo were very clean and comfortable. I would recommend the hotel and their staff. On the last day we were picked up at the hotel and transported back to a large bus in Pompei. When we were allowed to board the bus all the double seats were taken with only singles available. We noticed that a family of four were using four double seats instead of two double seat. We were forced to seat in the rear of the bus which proved to be a hardship for me when I trip on the rear platform and cut my knee. My husband had to ask the personnel on the bus for a bandage because my knee was bleeding. The tour was very misleading and not at all organized to our liking. The staff on the return trip from Pompei to Rome were not at all attentive. This tour on the most part was amazing! A few problems with all the bus transfers but all the guides were wonderful . Lunch in Naples... bad ! Sorrento hotel had amazing views. Tour lunch in Capri was excellent followed by a chairlift to the top of the island ! 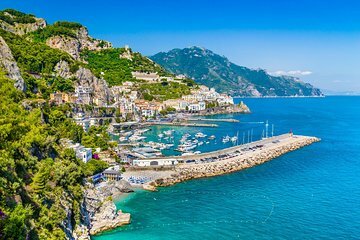 We booked 4 trips with Viator when we went to Italy in August, 3 of the 4 were day trips which we gave all 5 stars review, and the fourth one was this three days trip to Naples, Pompeii, Sorrento, and Capri. Naples, Pompeii, and especially Capri tours were great. The local tour guides were professional and the transportation arrangements were on schedule. We had wonderful time. But once when we arrived in Sorrento, we were on our own. No introduction of the city, nor recommendation of where we should do or go in Sorrento. The lady came with the bus met us at Pompeii did recommend to contact her if we wanted to go to Amalfi Coast with additional charges. We were glad we didnt listen to her. We spent the third day walking around in Sorrento city center and found the fine sandals shops, gelato places, lemoncello, and cute souvenirs shops. Also one thing about the hotel in Sorrento. The bus dropped us off in front of Grand Hotel Vesuvio, and we were left there to check in to the hotel by ourselves. I dont know if that was normal or not since we usually planned our own travel and it was the first time we went with tour company. First room we were given was on the third floor. The room floor was covered with yellow dust like sand and the room was filled with unpleasant odor. There was no view other than a dirt giant wall blocked right in front of the back balcony. The worse part was there were lot of ants crawling on the floor. I was very disappointed since I was told this was a 4 stars hotel according to Viator. After I talked to the hotel front desk, the hotel switched us to a second room which was on the 5th floor. The room had odor too but at least the floor is cleaner and no ants. While I was ready to clean up the room a little by myself, the phone rang, the hotel manager called and offered us to a better room. The third room was a very nice clean one with great ocean view. Finally! We were pleased. P.S. the electricity on the entire floor in the hotel went out one night for about 10 minutes. We were glad we had flashlight on our phone. The tour was all that they described- very comprehensive,professioal, on-time, informative...vehicles were top knock, guides were full of great information and pleasant- we kept on schedule and accomplished all that was promised. It was very well-run I would recommend. The Sorrento and Amalfi portions of this trip were awesome and I would highly recommend. We stayed in an amazing hotel Michelangelo which was VERY nice, in a perfect location downtown and had some of the best food we had in Italy especially awesome since we were vegetarians!. However, the Naples portion of this was VERY unimpressive and a waste of time. What I would recommend is to do Pompeii and Vesuvius this tour did NOT include Vesuvius which is unfortunate since the hike up was a lot of fun, skip Naples and then get to Sorrento. So maybe do some sort of mix and match if possible? But don't miss out on the Amalfi and Blue Grotto part--one of the highlights of our trip!! Tour guide Fabriano was phenomenal in Pompeii. Everything about Pompeii was amazing! Capri guide Sasha was awesome, he had to handle both the English and Spanish group - not sure what happened there and why we were put together..maybe a guide called in sick? Capri was gorgeous. Our main tour guide from Naples I can't remember his name, bald headed guy was awesome as well. All our guides were very knowledgeable and friendly. Blue Grotto happened to be closed when we went which was a bummer. The tour was amazing!!! We saw so much in so little time. It was so much fun and informarative. Great, amazing, funny, patient, and helpful - very helpful- staff. Saw things and places I would never see alone. Was worth every penny.